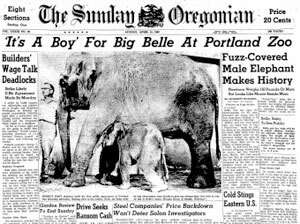 The first baby elephant to be conceived, born and to survive in a zoo in the United States so far as the records show was born on April 14, 1962 at the Portland Zoo (now Oregon Zoo). Bell, who has been elephanticipating for 635 days, presented the nation with its first home-born elephant in 44 years at 5:58 a.m. Saturday. Mother and her fuzzy-faced baby are doing fine. In fact, “Fuzzy-Face” made his public debut at the elephant house six hours after birth when he and his mother made an appearance behind the glass in the show window of the elephant house. . .
His tail is longer than his trunk. His eyes are bigger than his appetite, red-rimmed and brown like his mother’s. He is altogether ridiculous, but abviously the apple of his mother’s eye. “Fuzzy-Face” was described as standing about three feet tall and weighing around 150 pounds. He was christened Packy on April 24, 1962. The name was chosen from over 3000 entries in a KPOJ radio station contest. Wayne W. French of Gresham was awarded a portable stereo set for suggesting the winning name (The Oregonian, 25-April-1962). Packy is all grown up now. He is one of the largest Asian elephants in the United States, 10-foot-6 at the shoulder, and weighs over 6 tons. He has sired 7 calves.